The Consumer Price Index (CPI) rose 0.5% in February after posting increases of 0.4% in December and January. Significant food price gains in the January-February months and three consecutive monthly jumps in energy prices have been the main culprits behind the recent upward trend of the CPI. 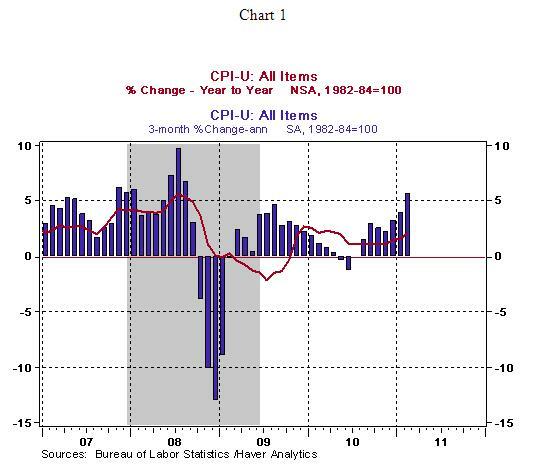 The CPI has risen 2.1% from a year ago, while the 3-month annualized increase is 5.6%. The core CPI, which excludes food and energy, moved up 0.2% in February, matching the increase of the prior month. 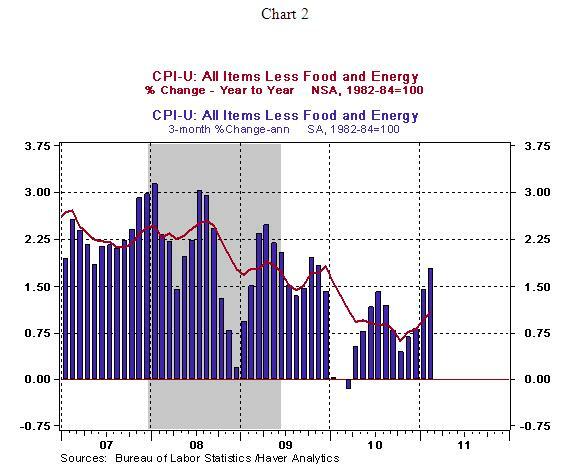 On a year-to-year basis, the core CPI increased 1.1% in February from a low of 0.6% in October 2010 and the three-month annualized gain is 1.8% vs. a low of a 0.4% increase in October 2010. These numbers suggest that the core CPI has hit bottom (see Chart 2) and heading in the direction the Fed would view favorably, for now. In February, a wide range of categories in the CPI posted gains. Shelter costs (+0.1%), new cars (+1.0%), medical care (+0.4%), household furnishings, and used cars. In addition, airfares have risen over 2.0% for three straight months, reflecting higher energy prices, and recreation costs (+0.3%) have posted two consecutive monthly gains. Apparel prices fell 0.9% in February after a 1.0% increase in January. 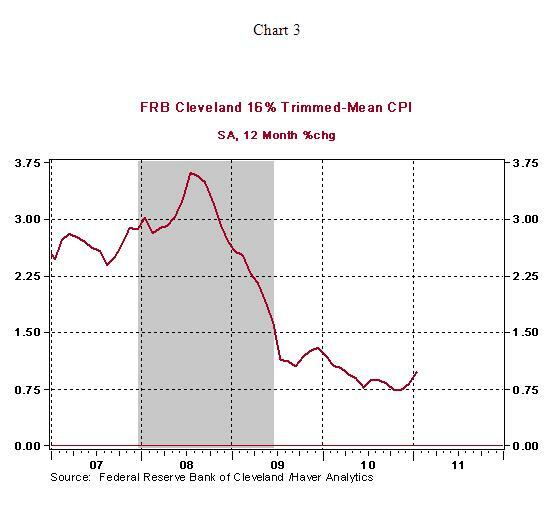 The Cleveland Fed's Trimmed-Mean CPI (see Chart 3) also indicates that the year-to-year change in the core CPI has bottomed out. The Fed's goal is to fulfill the dual mandate of price stability and full employment. QE2 was put in place in November 2010 to address the significant shortfall from the dual mandate. To the extent that recent economic data indicate the "economic recovery is on firmer footing" and the core CPI trend suggests a significant reduction of a threat of deflation, the Fed is nearly certain to complete the $600 billion purchase of Treasury securities and watch the evolution of the economy before considering a change of the monetary policy stance in the near term.